Repertoire which has been central to the lives of most pianists for over a hundred and fifty years will always present a formidable challenge; happily, Cédric Tiberghien’s account of some of Chopin’s greatest and most popular works need fear nothing by way of comparison to the famous recordings of the past. These views expressed in the nineteenth century apply no less keenly today, for which other collection of music of the same length provides such a range of mood, colour and texture? Many of the preludes last less than a minute; only a couple longer than three minutes, yet as Theodor Kullak said of them, ‘in their aphoristic brevity they are masterpieces of the first rank’. The use of the title ‘prelude’ for a short, independent keyboard work was not new. In Bach’s time, a prelude usually preceded something else, whether a fugue or a suite of dance movements. By the beginning of the nineteenth century, it had become common practice for pianists to improvise briefly before their performance. ‘Preluding’ was an opportunity to loosen the fingers and focus the mind (a tradition that lasted well into the twentieth century), one which inspired sets of preludes in all the major and minor keys by several leading pianist-composers of the day. These rarely stray beyond the realm of the technical exercise. It was left to Chopin, as was his wont, to raise an existing form to a new level, redefining the term ‘prelude’ and providing a model for later cycles by Alkan, Busoni, Rachmaninov and others. Chopin had begun writing the set of twenty-four preludes in 1836. Their completion coincided with the beginning of his liaison with the novelist and playwright George Sand. With her former lover threatening a duel, in early November 1838 the new couple thought it wise to leave Paris for a time and spend the winter in Majorca, taking with them Sand’s two children, Maurice and Solange. They travelled separately, Chopin bringing with him some of his treasured volumes of Bach, a supply of manuscript paper and seventeen of the preludes. He had already sold them to the publisher Camille Pleyel for 2,000 francs (a domestic servant’s annual salary was about 500 francs at this time), some of which had been paid in advance to enable Chopin to travel to Majorca. The French edition of Op 28 would be dedicated by Chopin ‘À Son Ami Pleyel’. The German edition, however, was dedicated to Johann Christoph Kessler (1800–1872), another friend whom he had met in Warsaw as a teenager and with whose set of études (Op 20, dedicated to Hummel) he was thoroughly familiar. Published in 1827 and much celebrated in their day, Kessler’s études (one in every key) were arranged in a cycle of fifths. Seven years later, he dedicated to Chopin his Op 31 set of twenty-four preludes, one in each major and minor key and using the same circle of fifths employed in his études. Whatever the cross-pollination between these two and other composers (Hummel, for example, employs the same scheme in his Op 67 preludes of 1815, another cycle that Chopin must surely have known), at least four of the remaining seven preludes were written on Majorca, one of which (No 4 in E minor) we know was completed at the end of November in Palma (before the party moved to the monastery at Valldemossa), at the time when Chopin fell seriously ill. It seems likely that the music reflected his innermost feelings, for on the same sheet of paper as the despairing E minor prelude is a sketch of the strange, melancholic A minor prelude (as well as the E minor mazurka which would appear in the Op 41 set). On 22 January 1839, Chopin wrote to his friend and amanuensis Julian Fontana in Paris that he was sending him the completed preludes with instructions that they be handed over in person to Pleyel. Among these miniature tone poems are some of the most celebrated works of all piano music—let alone Chopin’s œuvre—including the ‘Raindrop’ prelude (No 15 in D flat), No 20 in C minor which inspired two sets of variations by Busoni and one from Rachmaninov, and No 6 in B minor, known to all young pianists, as is the above-mentioned E minor prelude which was played on the organ at Chopin’s funeral by Lefébure-Wély. 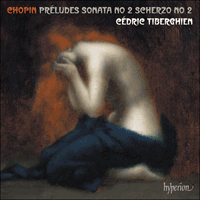 Cédric Tiberghien follows these twenty-four miniatures with one of Chopin’s most beloved large-scale works, the Piano Sonata No 2 in B flat minor, Op 35, known universally as the ‘Funeral March’ sonata because of its celebrated third movement. This was in fact the first to be written, its grief-racked tolling surely one of the best known (and certainly most parodied) themes in all classical music. Its origin can be dated precisely, for on 28 November 1837—the eve of the anniversary of the November 1830 uprising in Poland—Chopin copied a fragment of the march into the album of an unidentified friend. Not only the key but Chopin’s performance instructions (presto and sotto voce) link the sonata’s last movement to the Scherzo No 2 in B flat minor, Op 31, written (and published) in the same year as the ‘Funeral March’. The scherzo is another form extended and redefined by Chopin. The quartet of independent works he composed with this title between 1831 and 1843 has little to do with the earlier scherzos of Beethoven and Mendelssohn or with the derivation of the word ‘scherzo’ (meaning ‘joke’ or ‘jest’), although Chopin does preserve the A-B-A structure of the minuet and trio, the scherzo’s musical antecedent. The B flat minor scherzo, the most popular of the four, opens with a striking phrase which has been aptly cited as an instance of scorn in music: a timid question followed by a forceful put-down. Wilhelm von Lenz, who studied the work with Chopin, reported that for the composer, ‘it was never questioning enough, never piano enough, never vaulted (tombé) enough, never important enough’. And on another occasion: ‘It must be a charnel house.’ There follows one of Chopin’s most inspired lyrical themes (in D flat major, as is the majority of the scherzo) before a chorale-like central section. Here the music becomes increasingly agitated before reaching an impassioned climax and a return to the opening subject. The coda is superbly written and conceived, for now the questioning phrase returns in an altered form followed by the answer. But this time the question has been answered—not with scorn but with complete accord, and the two hurtle together towards the scherzo’s triumphant conclusion. L’emploi du titre «prélude» pour désigner une œuvre pour clavier courte et isolée n’était pas nouveau. À l’époque de Bach, un prélude précédait généralement quelque chose d’autre, soit une fugue soit une suite de mouvements de danse. Au début du XIXe siècle, il était devenu pratique courante pour les pianistes de faire de courtes improvisations avant leur concert. «Préluder» donnait la possibilité de se détendre les doigts et de se concentrer (tradition qui perdura longtemps au XXe siècle), ce qui inspira des recueils de préludes dans toutes les tonalités majeures et mineures à plusieurs grands pianistes compositeurs de l’époque. Ils s’écartèrent rarement du royaume de l’exercice technique. Il restait à Chopin, comme il en avait l’habitude, d’élever une forme existante à un niveau supérieur en redéfinissant le terme «prélude» et en fournissant un modèle à des cycles ultérieurs d’Alkan, Busoni, Rachmaninov et d’autres compositeurs. Chopin commença à écrire le recueil des vingt-quatre préludes en 1836. Leur achèvement coïncida avec le début de sa liaison avec la romancière et auteur dramatique George Sand. Son précédent amant menaçant de se battre en duel, le nouveau couple jugea, au début du mois de novembre 1838, qu’il serait sage de quitter Paris quelque temps et passa l’hiver à Majorque, emmenant les deux enfants de George Sand, Maurice et Solange. Ils voyagèrent séparément; Chopin emporta avec lui certains de ses précieux volumes de Bach, une provision de papier à musique et dix-sept des préludes. Il les avait déjà vendus à l’éditeur Camille Pleyel pour deux mille francs (le salaire annuel d’un domestique s’élevait à environ cinq cents francs à cette époque), don’t une partie payée à l’avance pour permettre à Chopin de se rendre à Majorque. L’édition française de l’op.28 allait être dédiée par Chopin «À son Ami Pleyel». Mais l’édition allemande fut dédiée à Johann Christoph Kessler (1800–1872), un autre ami avec lequel il s’était lié à Varsovie au cours de son adolescence et don’t Chopin connaissait à fond le recueil d’études (op.20, dédié à Hummel). Publiées en 1827 et très célèbres en leur temps, les études de Kessler (une dans chaque tonalité) étaient disposées en un cycle de quintes. Sept ans plus tard, il dédia à Chopin son recueil de vingt-quatre préludes, op.31, un dans chaque tonalité majeure et mineure, utilisant le même cycle de quintes employé dans ses études. Quelle que soit la fécondation réciproque entre ces deux compositeurs et certains autres (Hummel, par exemple, emploie le même procédé dans ses préludes de 1815, op.67, autre cycle que Chopin devait sûrement connaître), au moins quatre des sept préludes restants furent écrits à Majorque, don’t l’un (le n° 4 en mi mineur) fut achevé à la fin du mois de novembre à Palma (avant que le groupe se rende au monastère de Valldemossa), à l’époque où Chopin tomba sérieusement malade. Il semble que la musique reflète ses sentiments les plus intimes car, sur la même feuille de papier que le prélude désespéré en mi mineur figure une esquisse de l’étrange et mélancolique prélude en la mineur (ainsi que la mazurka en mi mineur qui allait être publiée dans le recueil op.41). Le 22 janvier 1839, Chopin écrivit à son ami et copiste Julian Fontana à Paris qu’il lui envoyait les préludes achevés avec des instructions pour qu’ils soient remis en main propre à Pleyel. Parmi ces poèmes symphoniques miniatures figurent certaines des œuvres les plus célèbres de toute la musique pour piano—sans parler de l’œuvre de Chopin—notamment le prélude de «La goutte d’eau» (n° 15 en ré bémol majeur), le n° 20 en ut mineur qui inspira deux cycles de variations à Busoni et un à Rachmaninov, et le n° 6 en si mineur, connu de tous les jeunes pianistes, tout comme le prélude en mi mineur mentionné ci-dessus qui fut joué à l’orgue aux funérailles de Chopin par Lefébure-Wély. Cédric Tiberghien fait suivre ces vingt-quatre miniatures de l’une des œuvres d’envergure de Chopin les plus appréciées, la Sonate pour piano n° 2 en si bémol mineur, op.35, universellement connue comme la sonate «Marche funèbre» en raison de son célèbre troisième mouvement. C’est en fait celui qu’il écrivit en premier, son glas d’une tristesse accablante étant sûrement le thème le plus connu (et certainement le plus parodié) de toute la musique classique. On peut en dater l’origine avec précision, car le 28 novembre 1837—veille de l’anniversaire du soulèvement de novembre 1830 en Pologne—Chopin copia un fragment de cette marche dans l’album d’un ami non identifié. Balayées par la rafale de l’aile éternelle de la mort. Non seulement la tonalité mais encore les instructions de Chopin quant à l’exécution (presto et sotto voce) créent un lien entre le dernier mouvement de cette sonate et le Scherzo n° 2 en si bémol mineur, op.31, écrit (et publié) la même année que la «Marche funèbre». Le scherzo est une autre forme étendue et redéfinie par Chopin. Le quatuor d’œuvres indépendantes qu’il composa sous ce titre en 1831 et 1843 n’a pas grand chose en commun avec les scherzos antérieurs de Beethoven et de Mendelssohn ou avec la dérivation du mot «scherzo» (signifiant «plaisanterie»), bien que Chopin préserve la structure A-B-A du menuet et trio, l’ancêtre musical du scherzo. Le scherzo en si bémol mineur, le plus populaire des quatre, débute par une phrase saisissante qui a été citée à juste titre comme un exemple de dédain en musique: une question timide suivie d’une vigoureuse remarque humiliante. Wilhelm von Lenz, qui étudia cette œuvre avec Chopin, signala que pour le compositeur, «elle n’était jamais assez interrogatrice, jamais assez piano, jamais assez tombée, jamais assez importante». Et à une autre occasion: «Ce doit être un charnier.» Vient ensuite l’un des thèmes lyriques les plus inspirés de Chopin (en ré bémol majeur, comme la majorité du scherzo) avant une section centrale dans le style d’un choral. Ici, la musique devient de plus en plus agitée avant d’atteindre un sommet passionné et un retour au sujet initial. La coda est une merveille d’écriture et de conception, car la phrase interrogatrice revient à présent sous une forme modifiée suivie de la réponse. Mais maintenant la question a reçu une réponse—pas avec mépris mais avec accord total, et les deux s’élancent ensemble vers la conclusion triomphale du scherzo. Dass man ein kurzes Einzelstück für Klavier „Prélude“ nannte, war nichts Neues. Zur Zeit Bachs ging ein Präludium für gewöhnlich etwas anderem voran, sei es eine Fuge oder eine Tanzsuite. Zu Beginn des 19. Jahrhunderts war es üblich geworden, dass Pianisten ihr Konzertprogramm mit einer kurzen Improvisation begannen. Das „Präludieren“ bot Gelegenheit, die Finger zu lockern und sich zu konzentrieren (eine Tradition, die bis weit ins 20. Jahrhundert hinein erhalten blieb); eine Gewohnheit, die manchen bedeutenden komponierenden Pianisten jener Zeit zu Sammlungen von Präludien in allen Dur- und Molltonarten anregte. Selten verlassen sie den Bereich der technischen Aufwärmübung. Es war Chopin, der wie so oft einer bestehenden Form eine neue Qualität geben wollte, indem er das Wort „Präludium“ neu definierte und damit das Vorbild für spätere Zyklen von Alkan, Busoni, Rachmaninow und anderen schuf. Seine Sammlung von 24 Präludien hatte Chopin 1836 begonnen. Ihre Vollendung fiel zusammen mit dem Beginn des Verhältnisses zur Schriftstellerin George Sand. Da ihr voriger Liebhaber mit einem Duell drohte, hielt es das junge Paar im November 1838 für geboten, Paris eine Zeitlang zu verlassen und den Winter zusammen mit George Sands beiden Kindern Maurice und Solange auf Mallorca zu verbringen. Sie reisten getrennt, und Chopin brachte einige seiner geliebten Bach-Bände, Notenpapier und 17 von den Präludien mit. Er hatte sie dem Verleger Pleyel bereits für 2000 Francs verkauft (ein Dienstbote verdiente damals etwa 500 Francs im Jahr); ein Teil davon wurde als Vorschuss gezahlt, um die Mallorca-Reise zu ermöglichen. Die französische Ausgabe des Opus 28 widmete Chopin „À Son Ami Pleyel“. Die deutsche Ausgabe dagegen war Johann Christoph Kessler (1800–1872) gewidmet, einem Jugendfreund aus seiner Warschauer Zeit, mit dessen Etüdensammlung, op. 20 (Hummel gewidmet) er wohlvertraut war. Die 1827 erschienene, seinerzeit weitverbreitete Sammlung enthielt eine Etüde für jede Tonart; die Sätze waren in der Folge des Quintenzirkels angeordnet. Sieben Jahre später widmete er Chopin seine Sammlung von 24 Präludien, op. 31, eines für jede Dur- und Molltonart, in derselben Reihenfolge. Wie auch immer hier einer den anderen inspirierte—Hummel etwa benutzte für seine Präludien, op. 67, die Chopin ebenfalls gekannt haben muss, dieselbe Anordnung—mindestens vier der verbleibenden sieben Präludien entstanden auf Mallorca. Von einem, Nr. 4 e-Moll, wissen wir, dass es Ende November in Palma vollendet wurde, bevor man gemeinsam ins Kloster Valldemossa umzog; zur selben Zeit erkrankte Chopin schwer. Vieles spricht dafür, dass die Musik sein Innerstes zum Ausdruck bringt, denn auf demselben Blatt findet sich das eigentümliche, melancholische Präludium a-Moll (neben der Mazurka e-Moll, die als Teil des Opus 41 erscheinen sollte). Am 22. Januar 1839 schrieb Chopin seinem Freund und Sekretär Julian Fontana nach Paris, dass er ihm die fertigen Präludien schicken würde, mit der Anweisung, sie Pleyel persönlich zu übergeben. Zu diesen Tondichtungen en miniature zählen einige der berühmtesten Stücke der gesamten Klavierliteratur—von Chopins Œuvre ganz zu schweigen—, darunter das „Regentropfen-Präludium“ (Nr. 15 Des-Dur), das Präludium Nr. 20 c-Moll, das Busoni und Rachmaninow jeweils zu Variationszyklen inspirierte, und das Präludium Nr. 6 h-Moll, das jeder junge Pianist kennt, ebenso wie das schon erwähnte e-Moll-Präludium, das Lefébure-Wély bei Chopins Beerdigung auf der Orgel spielte. An diese 24 Miniaturen schließt Cédric Tiberghien einer der beliebtesten großen Werke Chopins an: die Klaviersonate Nr. 2 b-Moll, op. 35, wegen ihres berühmten dritten Satzes bekannt als „Trauermarsch-Sonate“. Tatsächlich war er der erste, den Chopin schrieb; sein trauervoller Pendelschritt zählt zweifellos zu den bekanntesten (und meistparodierten) Themen der klassischen Musik. Seine Entstehung kann recht genau angegeben werden, denn am 28. November 1837, dem Jahrestag des polnischen Novemberaufstands von 1830, trug Chopin einen Teil des Marsches in das Album eines heute unbekannten Freundes ein. Nicht nur die Tonart, sondern auch Chopins Spielanweisungen (presto und sotto voce) schlagen eine Brücke vom Finale der Sonate zum Scherzo Nr. 2 b-Moll, op. 31, das Chopin im selben Jahr wie den Trauermarsch schrieb und dann auch veröffentlichte. Das Scherzo ist eine weitere Form, die Chopin erweiterte und neu definierte. Die vier selbständigen Werke dieses Titels, die Chopin zwischen 1831 und 1843 komponierte, haben wenig mit den älteren Scherzi eines Beethoven oder Mendelssohn oder gar mit der Herkunft des Wortes zu tun, das „Witz“ oder „Scherz“ bedeutet; allerdings behält Chopin den A-B-A-Aufbau des Menuetts mit Trio bei, des musikalischen Vorläufers des Scherzos. Der markante Anfang des Scherzo b-Moll, des beliebtesten der vier Scherzi, wurde treffend als musikalisch gefasste, harsche Zurückweisung beschrieben: eine schüchterne Frage, gefolgt von einer niederschmetternden Antwort. Wilhelm von Lenz, der das Werk mit dem Komponisten einstudierte, berichtete, für diesen sei es „nie genug Frage, nie piano genug, nie genug gewölbt (tombé), nie bedeutsam genug“ gewesen … „Ein Todtenhaus muss es sein!“ Es folgt eines der schönsten lyrischen Themen Chopins (in Des-Dur wie der Großteil des Scherzos), dann ein choralartiger Mittelteil. Hier wird die Musik immer erregter, bevor sie einen passionierten Höhepunkt erreicht und zum Anfangsthema zurückkehrt. Grandios geschrieben und geformt ist die Coda: Hier kehrt die fragende Figur verändert wieder, gefolgt von der Antwort—doch nun ist die Frage beantwortet, und zwar nicht abweisend, sondern zustimmend; und beide Motive stürmen vereint in den triumphalen Schluss des Scherzos.